This tool allows the design of a classification model by means of partial least squares discriminant analysis (PLS/DA or DPLS). 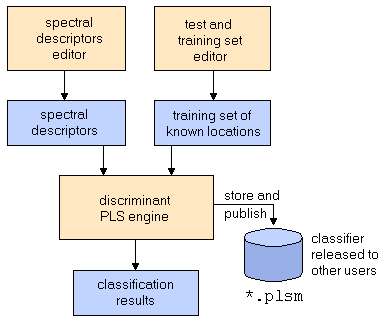 You first have to define and/or load a set of spectral descriptors and a set of training data. The training dataset specifies individual points in an image with known class assigments. After the design-process the model can be stored and applied to other data sets. Load the spectral desciptors by clicking the button. Adjust the number of factors and verify your model by using the tabs in the lower part of the window. The upper part of the window shows the list of descriptors and a table containing the training data. 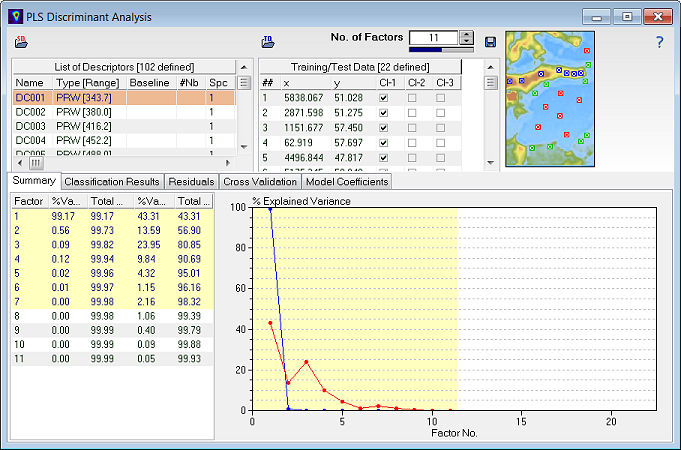 The corresponding data points of the training dataset are depicted in the top right graph combined with the currently selected descpriptor as a background. The following table gives an explanation to the tabs. Summary The table on the left hand side contains the explained variance for X and Y for each factor. Two additional columns show the integral over these values, starting from factor 1. The graph on the right hand side depicts the X values (blue) and Y values (red) over the corresponding factor number. The number of factors can be specified by either clicking on the graph or using the selection in the upper right window. Classification Results The plot on the left hand side depicts the confusion matrix for each class. If the actual and predicted classification coincide, the data point in question appears either in the upper left if the result is positive/positive or the lower right part of the matrix if the result is negative/negative. If the classification contradicts itself, the data point either appears in the lower left part or the upper right part, marked with a red x. The number inside each cell corresponds to the number of assigned data points. The plot on the right hand side depicts the classification for the currently selected class in a color coded form. Residuals This graph depicts the residual value for each test data point. Cross Validation This tool allows a cross-validation of the calculated model. The calculation can be initialized by clicking on the "Start Cross Validation" button and can be aborted by clicking the "Abort" button. "Test Set Size" signifies the number of data points, that shall be excluded from the original training set. The result of the cross validation is depicted in the graph window, where the different values of the root mean square error of prediction [RMS(EP)] are plotted for each factor number. The table on the left hand side summarizes these results as mean error and standard deviation. Model Coefficients This graph depicts the model coefficient for each spectral descriptor. By moving the mouse over the peaks, one can read the corresponding values from the boxes at the bottom left. Hint: The following video shows how to create a classifier based on PLS/DA from scratch.